home is where they send us...: MERRY CHRISTMAS! Merry Christmas from Gator, Peanut, Achoo & Baby A! I hope you and your family had a joyous holiday! Our holiday was fantastic! 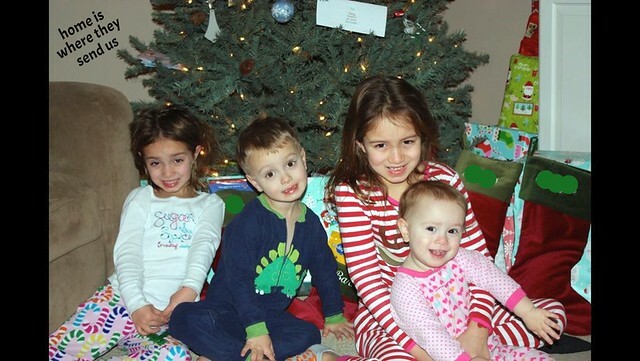 The kids and I somehow managed to all get the flu about 10 days before Christmas. We were sick from 4-7 days and then slowly got our strength back. I was a bit bummed about catching the Flu...I mean, who wants it? Anyways - the point is I missed out on all these PLANS I had thanks to the awesome Family Advent calendar we had going...but, we worked at getting it all done just a few days before Christmas and managed to celebrate Christmas healthy! A few days after we were feeling 100% we baked cookies. They were delicious! 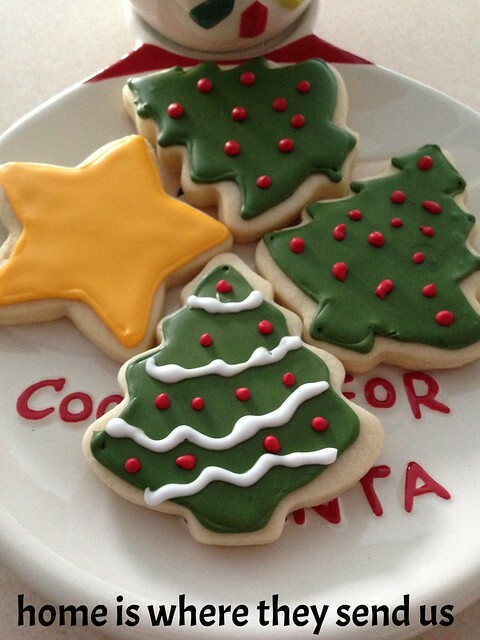 My friend Melissa in Texas (she owns Buttercream Blessings) taught me how to make these fantastic cookies. I made a promise never to share the recipe -- so I can't share but I can tell you they taste AMAZING! If you are local - I'll share some actual baked cookies! The kids just had so much fun making these (yes, these were designed by Gator -- age 7)!! We also went to visit Santa. The weather was actually pretty warm which was awesome since we had to wait in line OUTSIDE. 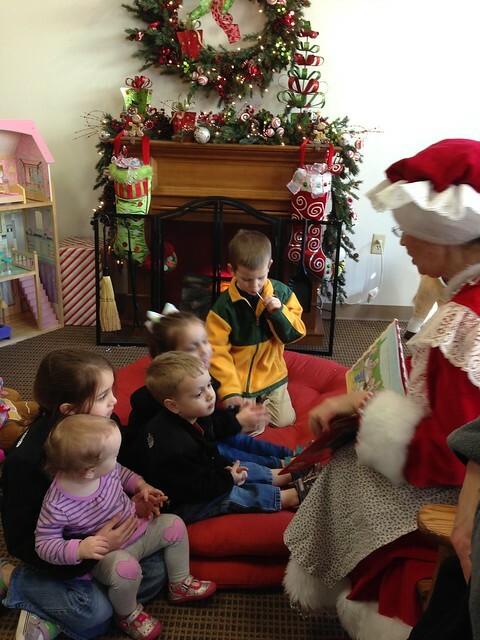 The kids were entertained by Mrs. Claus who read them a story (or three). She was pretty cute but this Mrs. Claus had NOTHING on the Mrs. Claus at SeaWorld SanAntonio! The kids all commented on how much they missed our traditional "milk & cookies with Santa". 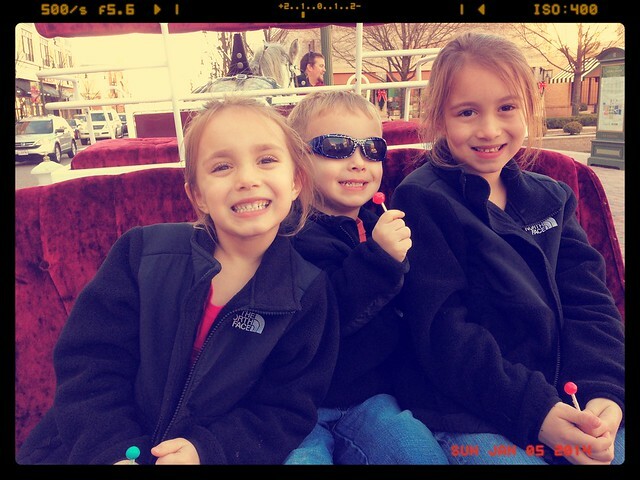 We took a horse and carriage ride! The kids have asked and asked -- finally, we gave in! Achoo cried so hard because he didn't want to get off! 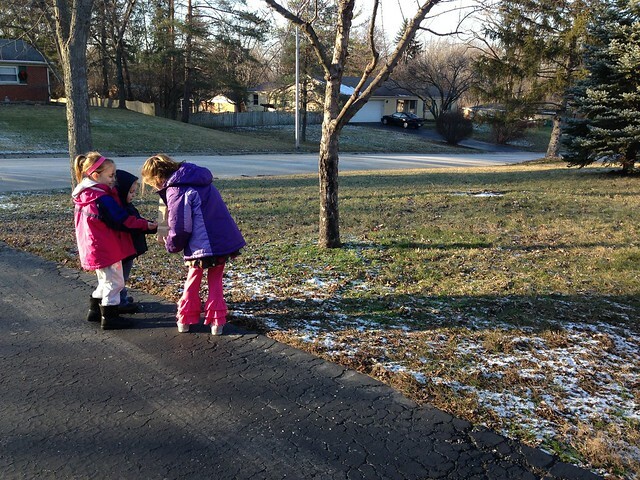 We sprinkled reindeer food for Santa's friends...the kids had a lot of fun tossing it around! The kids really had such a great holiday (after they recovered). Looking back at the month I decided a few things need to change for next year! First - I love how we do Want. Need. Wear. Read. (from us to the kids) and one Santa gift. The dilemma then came when they each wanted to buy each other something. We let them. I'm trying to decide between allowing them to purchase each other gifts and picking names so they just buy one gift. The gifts were small Baby A just got Little Pony's, Peanut got LipGloss from Achoo. But it all adds up. Also, I want to really celebrate the Season. We were traveling at Thanksgiving, trying hard to cram in school (to get ahead) and then we got sick. Next year -- I'm definitely taking the ENTIRE month of December off from school. I want to do all sorts of fun festive advent related activities. (I wasn't able to take this December off since we got a later start to school because of our move). Lastly - I wanted to share a couple photos! 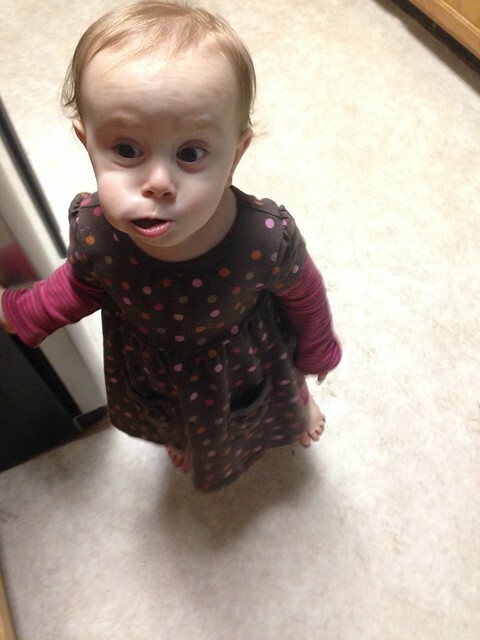 Baby A LOVES Lindt Balls. LOVES chocolate. She's hilarious! And, the kids love gymnastics. They were super excited to "play" gymnastics at home. 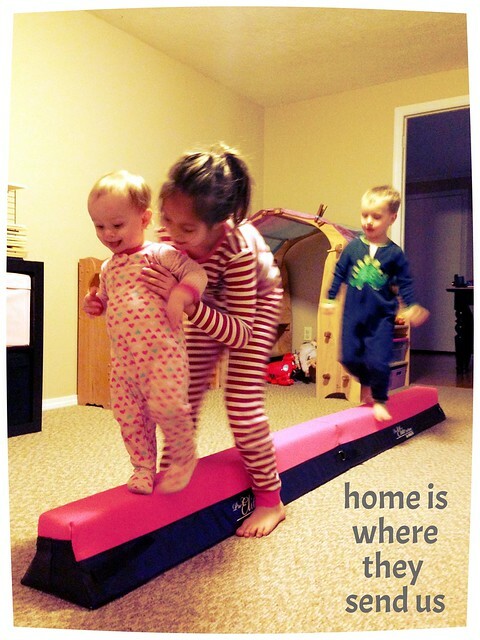 They are teaching Baby A (16 months) how to walk on the balance beam! Hope you enjoyed our Christmas update!